The T-800 brings clear, reliable communication to everyone, whether you rely on a CB for business or simply want to chat with friends. With multi-band AM/FM operation, auto-squelch, bright LED display, signal meter and multifunction microphone, it's got all the essentials. The T-800 was designed with simplicity in mind, so anyone can easily use it. The large volume knob gives you ultimate control, and the EU / UK switch allows you to quickly change bands at the flick of a switch. Change channel without even touching your radio, and activate auto-squelch from the palm of your hand. The T-800 radio lets you spend less time adjusting and more time communicating. Programmed to our own specification for use in the UK and Europe. The T-800 is equipped with all the major European bands and AM/FM operation so is ready to go wherever you are. 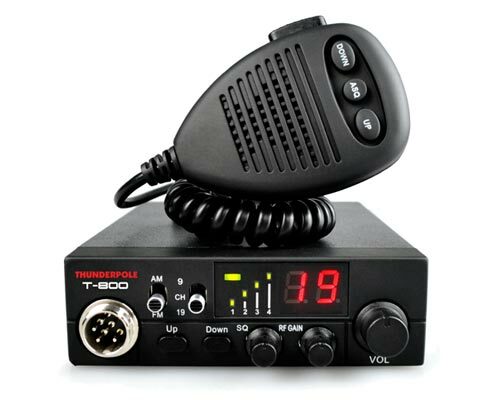 The T-800 is also available in the UK's favourite CB radio pack, the 'Thunderpole Starter Pack'. This includes the T-800 radio, choice of antenna, vehicle mount, cable and everything else you need to get started. We can even fit a cigarette lighter plug, to help get you up and running as quickly as possible. The T-800 is designed to give you trouble-free communication everyday. From the advanced circuitry inside to the heavy duty metal chassis, the T-800 has been engineered to give you the superior performance you would expect from Thunderpole. Buy a brand new T-800 with the included microphone, bracket, screws, mic holder, power lead and full english instruction manual. Buy a brand new T-800 in our popular Thunderpole Starter pack, which also includes an antenna and mount of your choice.